The millennium may have occurred a few years back, but the next Century has recently arrived. This spring, the 10-year-old Century underwent a $55-million makeover to bring the ship in line with Celebrity’s newer Millennium-class ships. The newly redone ship made her European debut in May before transferring to the Caribbean this November. I had the opportunity to experience the Century on her first Caribbean voyage of the season, a five-night cruise to Key West and Grand Cayman. The ship certainly doesn’t feel old, though a few features could still use improvement. Overall, you can’t go wrong with a ride on the new Century. Let’s get the bad news over with: I wasn’t a fan of Celebrity’s verandah stateroom. Even the inside cabin I visited seemed to have a better layout and no wonder—the inside and outside cabins are actually larger than the verandah rooms. The main problem is that there’s not enough space to walk between the bed and the wall or between the desk and the tiny sitting area. My friend and I kept bumping into each other and the furniture. By the first evening, the lounge chair, desk, and corners of the room were overflowing with our books, towels, cameras, and other possessions. For me, the beds were the worst part of the room. Even Celebrity’s new bedding program couldn’t hide the fact that the mattress corners had to be rounded so guests can squeeze around the bed to get to either side of the stateroom. This means that when you split the double bed into two twins, one side of the mattress is roughly six inches shorter than the other. If you’re remotely tall, your feet will dangle off the end, and the mattresses are so narrow that you can’t exactly sleep only on one side of the bed. Needless to say, my shorter companion enjoyed her sleeping arrangements much more than I did. The cabin did have some nice touches such as a decent-size shower and plenty of closet space. The verandah was definitely a boon on a Caribbean itinerary, and we often ate breakfast or watched the ship sail out of port from our private balcony. The flat-screen TV was a nice (and necessary) touch, and we were amazed with its interactive elements. We even used the television to order room service. Century’s public areas are much nicer than the staterooms. Of all the lounges, my favorite was the Martini Bar. The bar top and back wall are made of frozen liquid, so you can trace your name in the ice as you wait for your drink order. The furniture is all white, but the crystalline ceiling fixtures shine blue, pink, and orange lights to change the color of the room every few minutes. Martinis are pricey, but the bar offers quite a selection. The Hemisphere Lounge features beautiful 180-degree views by day and is a dance club at night. Though the dance floor isn’t often packed early on, the place was jumping around midnight on ’80s night. I didn’t spend much time in the dark-wood piano bar, but from what I heard, the pianist wasn’t too inspiring. Two larger lounges played host to a big-band orchestra and cheesy theme parties, such as a sock hop and hoedown. Up on the pool deck, the two salt-water pools look small but seem spacious once you’re in the water. However, if you want to sit near the pool, get up early—the deck chairs are snapped up quickly. I was disappointed that many of the loungers seemed to be broken as well. Next to the pool, the newly redone AquaSpa has multiple treatment rooms, including a barber shop for men. The highlight is the Persian Garden spa lounge, complete with steam rooms and rain showers. Two Internet areas offer a handful of terminals. At 75 cents a minute, the connection is too slow to be worth your money. The computer staff (whom I never saw) reportedly teach classes on using your digital camera and uploading photos. I was pleased with the quality of the food in the main dining room, and the service was quite good. Each night, you choose an appetizer, soup, salad, main entree, and dessert, and vegetarian menus are available on request. Favorites such as shrimp cocktail, escargot, and Caesar salad are available every night. The waiters are quite happy to bring you extra dishes if you can’t choose between two options. Our waiter and assistant waiter were friendly but reserved, and our assistant maitre d’ was a total hoot. He definitely made his visits memorable with his humor and added a lighter touch to dinner. The buffet restaurant on the pool deck is quite confusing on first glance. That’s because the two sides of the restaurant have different stations, but that’s not apparent from the beginning. My recommendation is to tour the entire restaurant before picking up a plate. For example, the pizza-and-pasta station is on the front left, but an ice cream bar is on the front right. In the back there is a salad bar that it took me two days to find. The food up here was good but not great, though I survived on the excellent cheese selections that were always available. At breakfast, the back station becomes an omelet bar, and in the late afternoon, you can find sushi and afternoon tea at the buffet. For a lighter meal (read: smaller portions), cross the pool deck to the cafe in the AquaSpa. But the best dining option is the new specialty restaurant, Murano. Apparently, reservations are accepted prior to departure, and on the first day of the cruise, we were limited to a choice of two seatings and only on that first night. So if you think you’ll be interested, get your travel agent to book you a table. Murano’s a la carte dinner costs $30 per person, and a special prix fixe menu with wine pairings costs $145. The food was exquisite, from a goat-cheese soufflé starter to the six-piece dessert sampler. The cheese cart has so many offerings that I was disappointed to have to choose only four. The service is impeccable, with waiters choreographing the presentation of each dish. A harpist plays while you dine, and the decor is beautiful. Dinner is a three-hour event, but is well worth the 30 bucks. When you’re not eating on the Century, you’ll most likely be lounging by the pool. Sunbathing seemed to be the most popular activity onboard. The activities staff did run games throughout the day, such as trivia, Pictionary, and name-that-tune. Bingo, as always, was a favorite, and two art auctions gave everyone a chance to bid on their painting of choice. I wasn’t thrilled with the activities on offer, but was perfectly content to read my book or take a nap during the day. The evening entertainment was pretty hit-or-miss. I highly enjoyed the Broadway revue, but walked out of the “Dance around the World” show. The one comedian I saw was obsessed with cruise ship humor, which I’ve heard too often and don’t think is that funny. A variety of musicians (classical, big band, jazz) played in the lounges in the evening, and there was usually a movie in the conference room. Often the best entertainment was watching my fellow passengers dance—some were awe-inspiring, many more were laughable. The midnight deck party was a typical conga-line-and-line-dancing affair. I would guess that most of the guests on this off-season cruise were in their mid-forties to early-seventies. I saw no more than a handful of children, but I’m told that Celebrity gets many more children during holiday weeks. My impression was that most guests were well off and used to treating themselves well. For instance, the yoga class I took was quite crowded and many participants clearly took classes at home as well. I saw a lot of wine being ordered at dinner, and spa appointments sold out quickly. I’d describe the attitude of the ship as everyday elegance. There were no raucous pool games, but it also wasn’t so formal as to be stiff. My shipmates were down-to-earth and friendly, but expected nice things on their vacation. I would assume that the staff makes more allowances for children on summer and holiday sailings. The teen lounge and arcade did seem quite nice though a bit out-of-the-way on deck 12. The only attitude I didn’t always like was the staff’s. I got misinformation from my concierge and the guest relations desk about the status of my shore excursions and dinner seating. Several people at my table never received disembarkation tags, gratuity envelopes, or customs forms on the last day. We could have avoided a lot of time waiting in line at the front desk if the staff were a little more together. 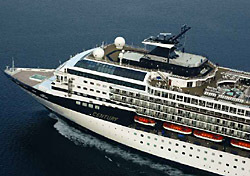 Celebrity is a premium line, which means that its pricing is typically higher than Royal Caribbean or Carnival, but lower than Crystal and Silversea. Although the Century’s Europe fares can run to thousands of dollars per person, the short Caribbean cruises can be great deals. This year, the Caribbean isn’t selling well for any of the lines, resulting in low fares all around. In mid-October, you could have booked a cabin on my five-night mid-November cruise from $299 for an inside stateroom, $349 for an outside stateroom, $619 for a verandah stateroom, and $799 for a suite. Prices starting at $60 per night are more reminiscent of mainstream prices than premium fares. In contrast, 12-night Europe sailings next summer start at $1,749—$146 per night for an inside cabin. It’s a big price difference for rooms on the same ship. So if you want to experience the new Century for the best possible price, these Caribbean sailings are well worth the cost. You get upgraded amenities and excellent food for the cost of a more average cruise experience. Celebrity can appeal to pretty much everyone. I would say that middle-aged and older couples are the target audience, but younger couples and families will certainly find plenty to keep everyone entertained. If you’re looking for lots of active onboard events or want top-of-the-line kids’ programming, you may be better off with a mainstream line. And if you prefer smaller ships or a lot of formality, you may want to look into a luxury line. But if your perfect cruise consists of great food, pool time, spa visits, and a lot of relaxation, Celebrity may just be the line for you. I never saw the Century before its makeover, but its new feel is modern and elegant. The ship has many beautiful rooms and while I’d wish for larger cabins, you can easily spend most of your days in the public areas or onshore. If my experience is typical, then this new Century is off to a great start.